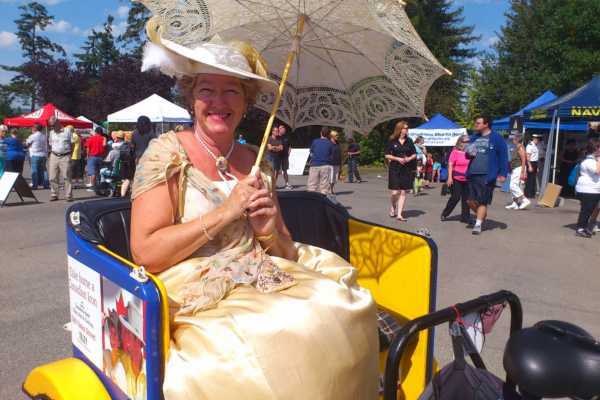 Through Canada’s garden and cycling capital the Victoria Pedicab Company (VPC) provides memorable tours for individuals and groups up to 40. You can expect professional, attentive service with pick up location, tour selection and departure time to fit your schedule and desires. Check out our tour promo video, our photos and our testimonials. If you still have questions or special requests, email us at acapeau@yahoo.com or call 250 884 0121. This 2 1/2 hour tour is specifically designed for cruise ship guests. It includes easy and convenient pick up directly at the cruise ship terminal in Victoria and guaranteed on time return to the terminal. Early morning and evening arrivals tour start times are also available. Please note, disembarkation from the ship typically takes 30 to 60 minutes after the cruise ship ties into pier. We receive all ships arriving in Victoria including evening arrivals. Your reserved tour operator will be waiting to greet your party when you exit the terminal doors. We want your visit to be stress free, relaxing and enjoyable! Please note that if your cruise cannot dock due to poor weather or other reasons a full refund is provided on your reservation. The Cruise Ship Visitor's Tour will show off Victoria's gorgeous inner harbour and buildings. Time is spent exploring the city, gardens and a beautiful character neighbourhood. Guests will have an option to visit shops in town, take pictures (or have their guide take pictures) of beautiful landmarks. Depending on your length of stay, guests will have the option to finish the tour in town with a guide map and instructions for getting back to town. We want to help you fall in love with our city by showing off its beauty, charm and friendly character! A fully guided 90 minute tour through Victoria’s lustrous gardens, dramatic coastline and oldest and friendliest Victorian neighbourhood; James Bay. Glide through the original Enchanted Forest in Beacon Hill Park--Victoria's green jewel. Cross over a stone bridge, pass under eagle and heron nests and unto the colourful and lush Sun Dial Gardens, Victoria’s favourite wedding photo location. Circle past the world’s tallest free standing totem pole on sacred native ground and sit in the crotch of a giant Redwood tree for some great photo opportunities. Enjoy world class views of the sea and the snow capped Olympic mountains. Descend into historic James Bay, full of picturesque Victorian character homes and award winning gardens. You will have an opportunity to visit the oldest grocery store in town and purchase local produce or excellent quality coffee or tea Most of this tour is via bicycle paths and quiet side streets that are otherwise prohibited to larger tour vehicles. A fully guided 2 1/2 hour tour featuring the Scottish Baronial Craigdarroch Castle and the spectacular Queen’s Gardens. Cruise past the gabled Church of Our Lord and St. Ann’s Academy with its’ 1858 chapel into leafy Rockland and its 19th century mansions. 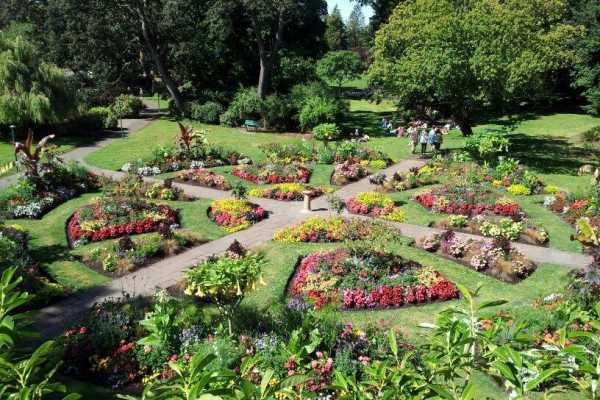 Skip off the tourist map and discover the Queen’s Gardens, rivalling Butchart Gardens. 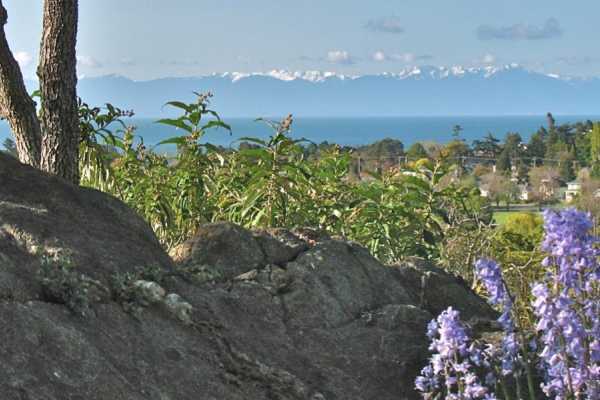 The gardens are perched dramatically over the sea and across from the majestic Olympic mountains. Roll on up to Craigdarroch Castle sitting on one of the highest points in Victoria overlooking the city. 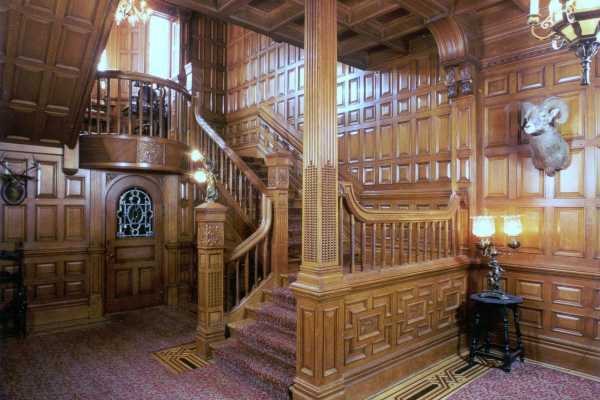 A cradle of 19th century opulence, the castle boasts the finest collection of residential stained glass in North America and some superior woodwork with a history of scandals (brought to life by your VPC tour guide) to match. Peer down from the scenic height of the tower over the city and its surrounding mountain ranges. Coast back past Christ Church cathedral and its old cemetery into the heart of town and have your guide point out restaurants that cater to your tastes. Tour Length: 5 1/2 hours Cost: $225 per guest Make a day of it; experience it all. 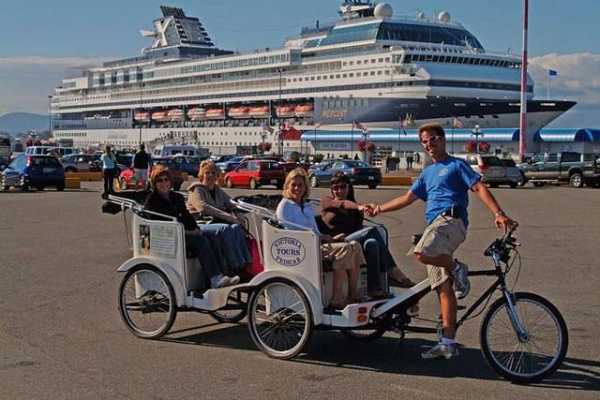 A fully guide pedicab tour which combines all aspects of our recommended tours. 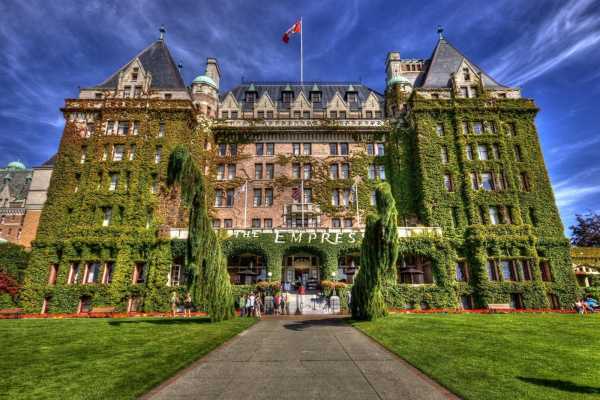 You will experience the must sees of Victoria’s best gardens, homes, attractions and downtown. The pace is relaxed and there will be opportunities for a meal break and other stops. This deluxe tour will leave nothing uncovered. A fully guided city 75 minute tour showcasing Victoria’s architectural jewels, amusing history and European sophistication. Plenty of opportunities are afforded to peruse century old Victorian shops and hidden alleyways offering a distinct advantage for experiencing the city’s best kept secrets. Victoria’s historical core is one of the best preserved and restored downtowns in North America. Relive yesteryear with your guide as he retells old stories while showing archived photographs from over 100 years ago. In Chinatown, be escorted through Fan Tan Alley where nearly 3,000 Chinese gambled away savings amidst the smoke of opium dens and factories. Taste the chocolate in Victoria’s finest antique store and visit the “Lojo” fashion district in its restored 19th century splendour. Your pedicab’s manoeuvrability and size allows guests to completely explore the colour, history and culture of this remarkable city. Customized Tours and Service Provide a fun filled experience for you group: pub crawls, scavenger hunt, conference transportation, hotel pick up or drop off. Allow us to be a part of a memorable honeymoon, anniversary or wedding. Use your imagination and we will help create the possibilities.